From the moment I first walked through the door at Black Sheep Pizza (St. Paul) a couple months ago, when that better-than-the-usual smell of pizza first intoxicated me, I knew this place was going to turn into a tradition. Nestled down a few steps from street level and so unassuming, the room was extremely simple, yet warm, with an open kitchen view to their coal fired pizza oven. A few of my closest girlfriends were with me, and we were doing a little celebrating. It was The Birthday Girl’s suggestion that we share some pizza and catch up on life, and I’m ever so thankful for her Black Sheep Pizza recommendation. Since that evening, I’ve introduced my own family to this little shop on the corner, and we’ve been enjoying some really great pizza nights. In fact, it was recently the birthday pizza request of our oldest daughter, too! 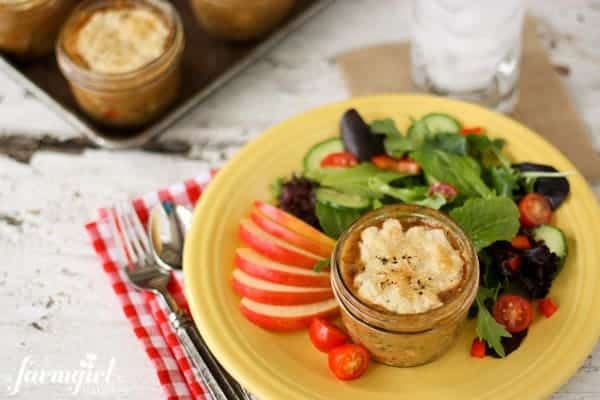 This Creamy Homemade Ricotta with Honey and Herbs is directly related to our daughter’s birthday celebration, when we ordered a similar appetizer at Black Sheep. I’ve bought little tubs of ricotta before, incorporating it into different pasta dishes and such, with those experiences always rating somewhere just around “average”. But that appetizer my family shared that evening…well it changed my view of ricotta, and I knew I had to find me some of that fabulous stuff! 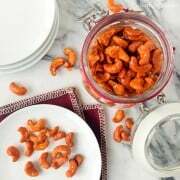 Little did I know, until I read Shaina’s post, that it’s super easy to make at home. And TONS better! I ended up making three different versions of ricotta, as part of my experimentation process. Each recipe used varying amounts of whole milk and heavy cream. Shaina’s version, with the largest percentage of whole milk, was the lightest in both taste and heft, with a more pronounced curd (although the curd was still small). It was delicious, and perfect for slathering on a toasted baguette for breakfast or as an accompaniment to a fresh salad. The version I’m sharing here is a very slight adaptation from Deb. Of the three recipes I tried, this one leaned heaviest on the richness of cream. Deb’s post, as always, is a great read, and takes you through her trials to result in her goal of a super dense and creamy ricotta. 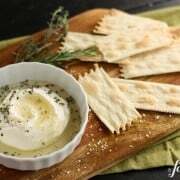 Its flavor and texture are much like a very soft and mild cream cheese. This luxurious creation is the Rolls-Royce of my ricotta experimentation, a very special treat. It was super hard for me to share…I wanted to eat it ALL! When I remade the Black Sheep’s appetizer at home, I used a lovely Spanish honey that I found at our local Kowalski’s (also available on Amazon). It’s light, yet flavorful, with just the slightest hint of orange blossom, and I would completely recommend it for this dish. This particular honey would also be fabulous in another favorite of ours, the Sweet-and-Salty Honey-Cheese Spread, with a sprinkling of fresh juicy blackberries. Add milk, cream, and salt to a medium saucepan. Cook over medium to medium-high heat, stirring frequently to prevent scorching, until milk reaches 190°. Remove pan from heat and add the lemon juice, then stir it just once or twice, gently and slowly, to incorporate. Let pan sit undisturbed for 10 minutes to let curds form. Wet a double layer of cheesecloth and ring out. Lay cheesecloth over the inside of a fine mesh strainer or colander that is set over a large heatproof bowl. Pour the curds and whey into the colander and let the curds strain for at least an hour, for very tender and loose ricotta. Strain for an additional hour or two for a ricotta that is firmer, like a very soft and tender cream cheese. Discard whey or save it for another use. Remove ricotta from the cheesecloth and enjoy immediately or store refrigerated in an airtight container for up to 3 days. To serve the ricotta with honey and herbs…in a small dish with sides, mound some of the ricotta in the center. Drizzle a bit of honey over and around the ricotta and then scatter lightly with fresh thyme and rosemary. Finish with a sprinkling of flaky sea salt and freshly cracked black pepper. 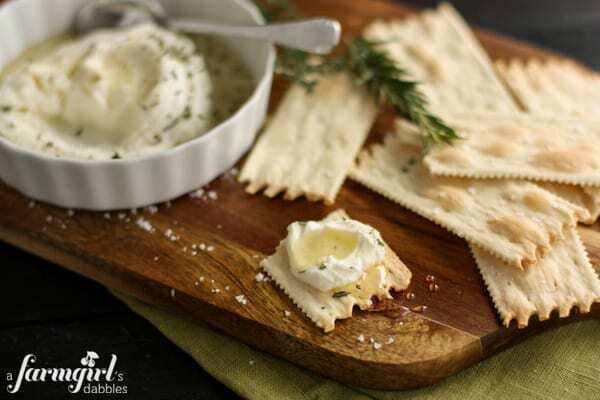 Serve immediately with crisp salty crackers. Some blackberries would be lovely with this, too! Appetizer inspired by a celebratory birthday meal at Black Sheep Pizza. Homemade ricotta very slightly adapted from Smitten Kitchen, originally from Salvatore Bklyn via Tasting Table. Disclosure: This post contains Amazon affiliate links (for the Spanish honey). Read my full disclosure here. You’ve totally inspired me to try making ricotta at home. This sounds wonderful — especially with the honey and herbs! Wow, Brenda! Your ricotta looks so beautiful, and I love that you served it as a spread with honey! Great idea. 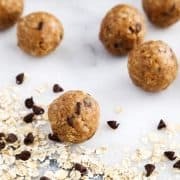 Now I’m waiting for the right time to make a vegan version of this recipe. Can’t wait! 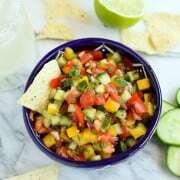 Wow- this sounds so fresh and delicious!! Perfect to serve at a spring party! OMG this looks fantastic and now I’m starving!!! I love homemade ricotta so much, almost obsessively! I can’t wait to try that honey. Simple Brilliance! I could eat the whole crock! I LOVE Black Sheep Pizza! I have never tried to make ricotta at home. I’ll add it to the bucket list for the kitchen! Thanks! Brenda – I was so excited to see this post. I’ve tried to make my own ricotta before, but it didn’t come out nearly as creamy as yours. I can’t wait to try it with the adaptations you’ve suggested….not to mention topping it with honey and herbs – how lovely! Hi Jess! You will absolutely fall. in. love. guaranteed. This sounds delicious! I really wan to make my own ricotta! I mean really, how cool is that! Plus, I love the honey! I’ve always wanted to make ricotta! My colleague is 100% Italian and I’m “this close” to begging her to teach me how to make it. This recipe looks amazing — and it might just be the tipping point for me to give it a go. Oh my goodness! Just reading this recipe I want to make ricotta myself. I love Ricotta cheese and had no idea it was something I might be able to make myself. The honey and herbs sounds that much more delightful. Thank you so much for sharing! homemade ricotta is the best! I need to get on this! Yum! For real – homemade ricotta is like Heaven. I have a hard time not eating it all when the curds are still warm with a drizzle of local honey over it. Oh man. Now I will be thinking about this all day long. YUM! Love the addition of the herbs B. You rock! The ricotta with honey and herbs sounds heavenly. I will have to try it with my next batch. I have not made it to Black Sheep yet but hear wonderful things. A trick that I learned when heating any type of milk is to ice the pan first. Just toss in an ice cube and swirl it around in the pan until it is melted. As long as you don’t touch the bottom of the pan with a metal spoon while heating, your pan will be scorch free. I do this when making yogurt and it does not affect the flavor of the product at all and makes for easy clean up. I always use this recipe when I need ricotta. It’s just SO much better than the tasteless stuff from the store! I haven’t tried it with honey and herbs, though. Yum! I love making things at home that most people would only purchase pre-made. Like cheese, mayonnaise, mustard, catsup…even marshmallows. It’s almost always less expensive and contains fresher ingredients with no preservatives. Great job with your ricotta, Brenda! 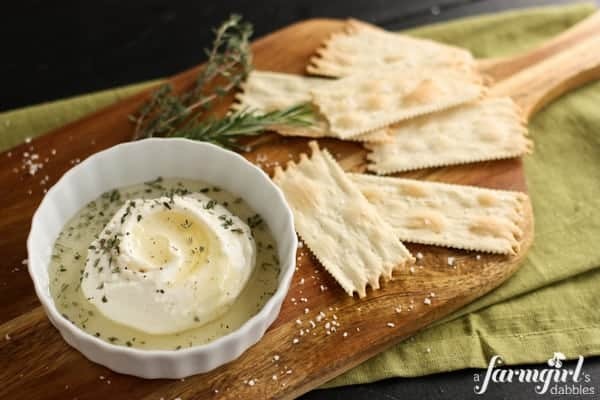 I can only imagine how incredible homemade ricotta tastes…love this appetizer idea! And I completely agree about the #7 pizza at Black Sheep. It is, hands down, my favorite. OK, this is amazing, Brenda. Love the combo! What a gorgeous recipe! 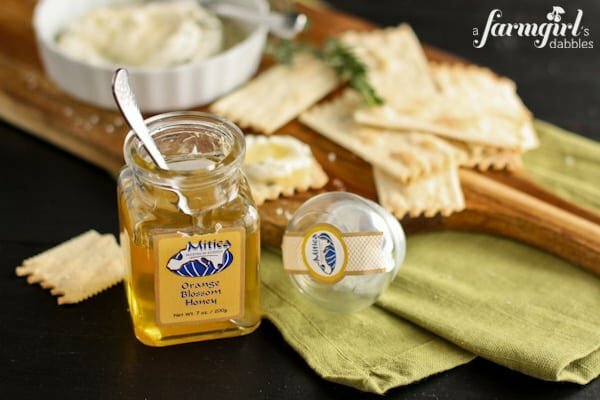 I am obsessed with orange blossom honey – what a delish combo with the ricotta!